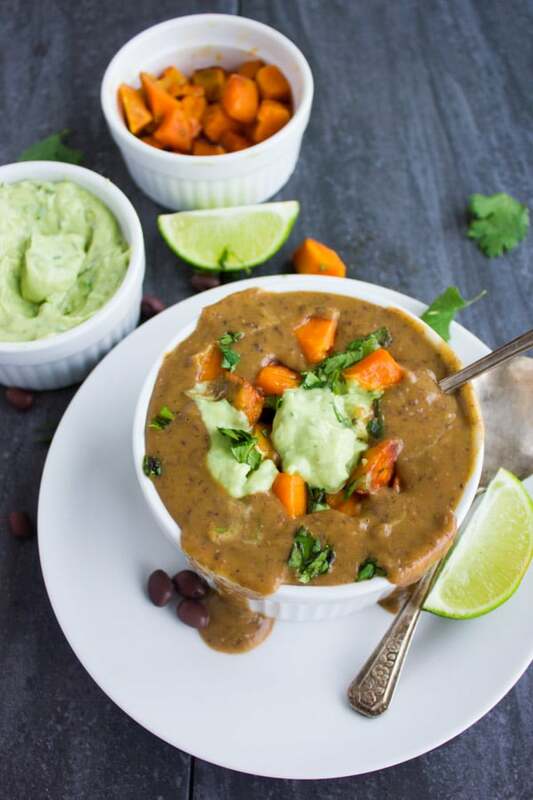 This easy yet impressive recipe takes the Cuban comfort food classic Black Bean Soup to the next level with the addition of roasted sweet potatoes and a smooth and light avocado crema on top! The perfect vegan soup to serve on a cold winter day. 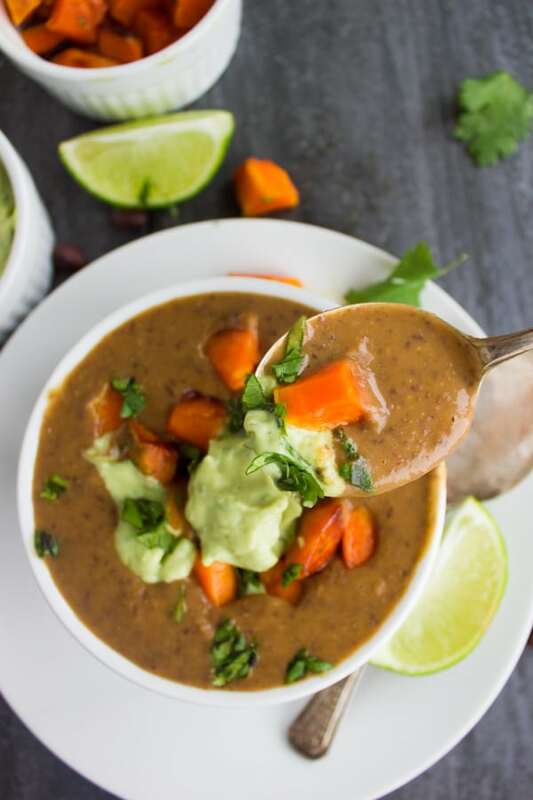 This sweet potato black bean soup recipe is the ultimate cozy soup for the cold season! Ultra smooth classic Mexican-Cuban black bean soup sweetened with sweet potatoes to perfectly compliment the creamy black beans. Topped with a luscious avocado crema that brightens up your palate and tiny cubes of roasted sweet potatoes instead of croutons—for extra veggie goodness! Yes, another soup recipe. I am officially on a soup mission here to get me through this cold season! But in all honesty, even when the weather is at its’ best— a bowl of soup is always a good thing! 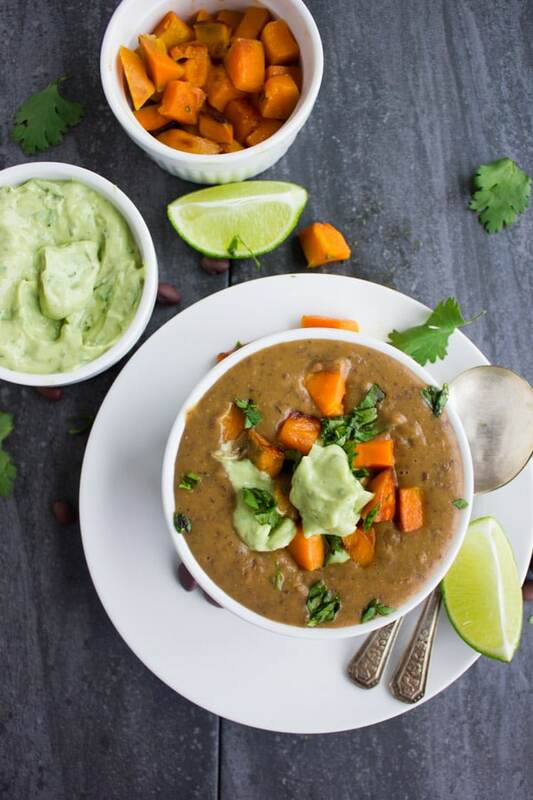 And this sweet potato black bean soup is a super good thing! This black bean soup recipe is another Miami inspired dish—along with my spicy mango chicken wings and many more to come! So when I moved to Miami about 13 years ago (sigh** 13!! ), we had a wonderful landlord—a huge, and I mean HUGE family with three generations and plenty of family gatherings. We were always invited to their family gatherings and that’s where I first tasted black bean soup and fell for it! I clipped up my generous neighbours’ recipe and have been making it over and over, until I actually twisted the recipe for a Cuban-Mexican fusion cooking class..and I was SO glad I did! So let me take a minute to tell you how fabulously easy an delicious this vegan black bean soup recipe is. It’s comforting, thick, naturally creamy (but no cream! ), sweet and deliciously bean tasting, spiked up with a bit of cumin and oregano with a garlicky note in the background. 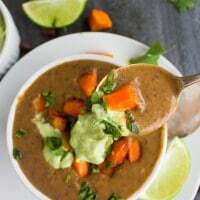 You may want to twist this basic black bean soup a little bit and spare 10 extra minutes—which I STRONGLY urge you to do and make some roasted sweet potatoes and a smooth avocado crema to take your black bean soup to the next level. !! I promise the results will be well worth your time! 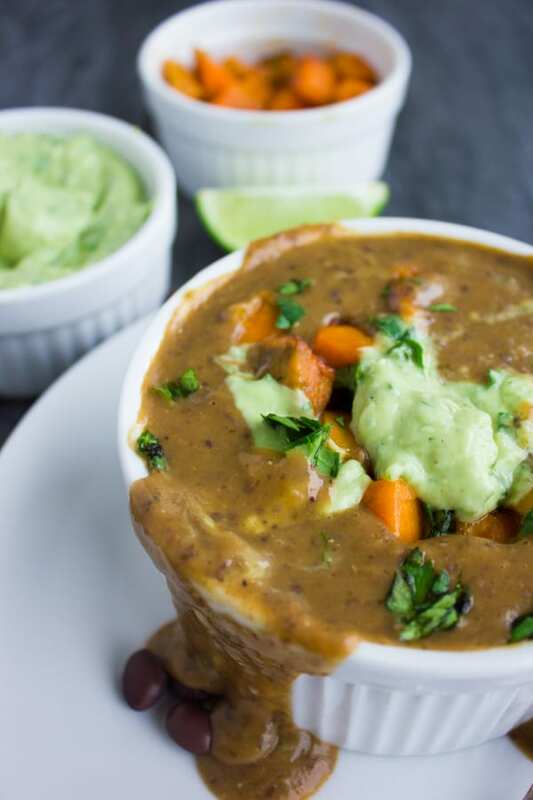 The avocado cream brightens up the black bean soup, gives it a lovely contrasting refreshing tang and adds to the whole look of this comfort food soup. I love sautéing onions and sweet peppers to get a load of flavor going, then I add in the garlic towards the end together with my spices. This step here gives me a subtle garlic flavor—which I absolutely LOVE with black bean soup. At this point, the beans, sweet potatoes, cilantro and stock go right in and are simmered up for 15 mins. Then it’s ready for blending. Ok, let’s start with the sweet potato cubes or croutons. Peel and dice up an extra sweet potato and simply roast them in the oven (375 degrees for 10 mins). 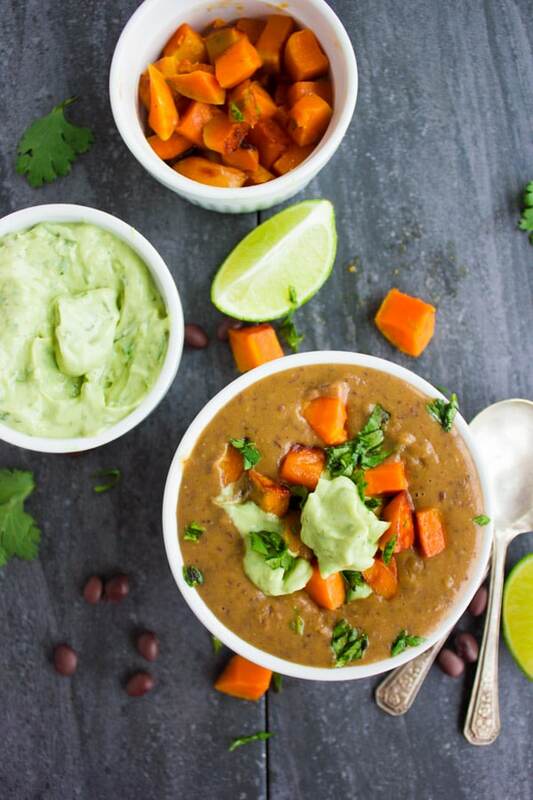 Now on to the Mexican twist on this sweet potato black bean soup —the avocado crema! Do you remember this fabulous flavorful and quick shrimp salad with avocado dressing or this Mexican style lentil detox salad ? Another example where the avocado crema takes the recipe to a whole new level! The avocado crema comes together in 2 mins in a food processor. It’s basically like a creamy guacamole (speaking of—did you try this crowd-pleasing foolproof classic Mexican guacamole yet?). So all you need is to process an avocado, scallions, cilantro, lime juice, plenty of cilantro, olive oil, and to make for the “crema” effect, add in sour cream. Make the Avocado Crema using this recipe. When making the crema, omit the sour cream if you’re vegan or watching calories, and just add in water—you will still end up with a creamy avocado crema! You can let this black bean soup simmer for as long as an hour if you want maximum flavor or just 15 mins if you’re rushed. 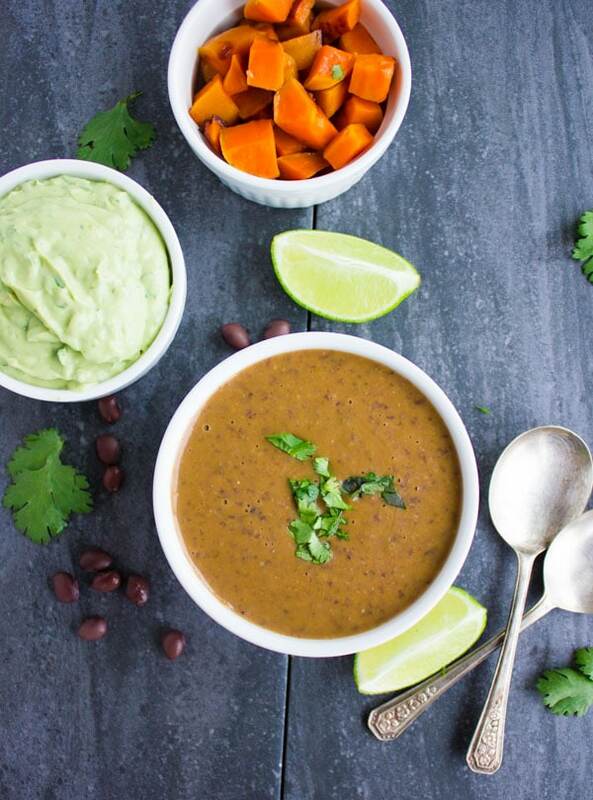 This easy yet impressive recipe takes the Cuban comfort food classic Black Bean Soup to the next level with the addition of roasted sweet potatoes and a smooth and light avocado crema! The perfect vegetarian soup to serve on a cold winter day. In a large pot, add the olive oil and saute the onion and sweet peppers with a pinch of salt for 3 mins until soft and the onions are slightly golden and caramelized, add in the cilantro and garlic. Sautee for just a minute more. Add in half of the diced sweet potatoes, beans, oats and spice. Give it a quick sauté then add in the stock. Bring the soup to a boil and lower the heat to low. Let the soup cook for at least 15 mins up to 1 hour. Add in the cilantro at the end. Using an immersion blender, blend the soup until smooth. Taste and adjust seasoning if needed. Serve the soup with a dollop of avocado crema, roast sweet potato cubes and more avocado crema. Process all ingredients in a food processor and process until smooth and creamy. While the soup is cooking, preheat the oven to 400 F. Place the remaining sweet potato cubes in a single layer in a baking sheet lined with foil and toss them with a bit of olive oil (a teaspoon) and cover the potatoes with foil. Roast them for 10 mins until tender. 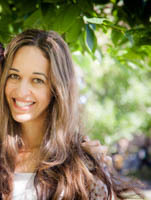 Thanks Felecia–I absolutely love this soup! That is a great looking soup and I love the addition of the avocado to it. I bet it add a silky texture to it. YUM. What delicious flavors you have going on here. YUM!! I am craving soup right now, even thought we are in Florida. Where we are at it is COLD!! Please hand me a cup of soup??? Thanks Gloria–I love a comfort soup like this anytime!